Prestigious chalet in the heart of the resort. Beautiful living space consisting of a large living room with fireplace, a dining room that can accommodate up to 14 people and a beautiful and large kitchen. At the same level you will find a beautiful master suite with bathroom, office area and dressing room. Upstairs, the four bedrooms and three bathrooms provide maximum comfort to each occupant. For larger family gatherings, the chalet offers an optional self-catering apartment located on the lower level. Many services are included, including the transport at the foot of the slopes, the daily cleaning, the breakfast ... To complete these services, a home cinema, a billiard table, a spa with table of message and sauna as well as an outdoor jacuzzi will allow you to spend wonderful moments of relaxation after a day of skiing. Built on the heights of the village, you will enjoy a breathtaking and panoramic view of the ski area. The chalet is a few minutes from the start of the slopes and 5 minutes walk from the village center. 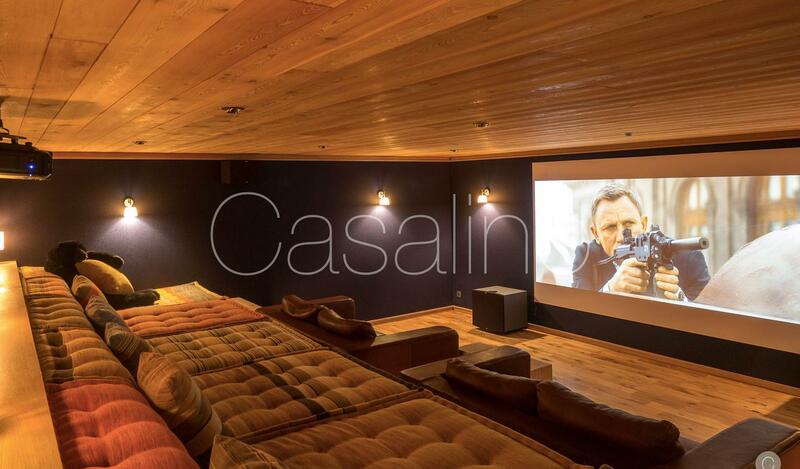 The tasty mix between old wood, very neat decoration and high quality equipment make this chalet one of the most beautiful of the French Alps.